← Wordless Wednesday! Time Travel Proof? This entry was posted in Christmas, Holidays, Humor and tagged Christmas humor, Elf on the Shelf, Elf on the shelf scary, holiday humor, humor, The Phil Factor. Bookmark the permalink. 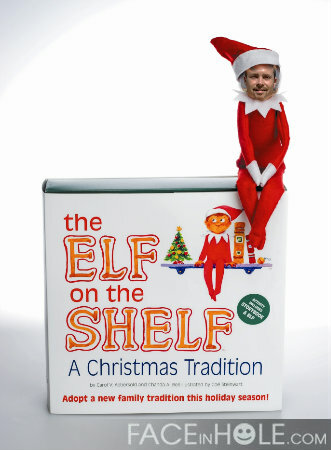 I’m glad I’m not the only person who has serious concerns about the mindset behind Elf on a Shelf – so glad it never became a thing over here in Australia – it just creeps me right out! I have, and will continue to, unfollow people on social media as soon as I see those ridiculous elf postings pop up. Drives me bonkers!! There is too many things that scare children these days this been one of them. I remember once looking on YouTube kids performing the trick with 2 pencils and asking charlie charlie are you there. Which to me doesn’t work anyway lol… But yeah children shouldn’t be terrified at Christmas. We have one but I’m too lazy to set up scenarios or anything else. Our Liam just sits on the mantelpiece looking happy. Little Miss Six loves him! OMG! All of this is sooo true! Well written! I am going to attempt another “scene” with the elf on the shelf tonight and let’s just say it’s a scene out of Silence of the Lambs. Awesome! I’m glad I follow you on Instagram! Oh yeah! You will be able to see it there too! I have never heard of this tradition, Phil. It does sound quite torturous for young kids. I torture my kiddos in other ways. I don’t need the Elf. Plus, it’s just extra work for me. And I can’t remember to move the little bugger every night. Thanks for exposing yet another way parents try to get the upper hand. I hate crazes like this. Our foster kid grew up with the elf and was horrified when we told her he never came to our house. So I went out and bought a mouse elf to appease her but it’s so annoying to have to think up messes for the critter to create. 🙂 This kid has already been traumatized so we grudgingly keep doing it. I keep hoping someone at school will break the news to her that it’s fake.